Every day the detonation of four million pounds of explosives echoes through the West Virginia mountains as a small army of companies lays bare the coal formed under the mountaintops over 200 million years ago. Like all wars, even environmental ones, there's collateral damage. "It's like living in Afghanistan or Pakistan," says Maria Gunnoe, whose childhood home where she still lives is just below ground zero for the Jupiter Mine's explosive mountaintop-clearing operations in Boone County. Removing 800 feet of mountain also destroys the ancient hardwood forest, which not only provides shade and supports wildlife but also gives the land the ability to retain water when it rains. 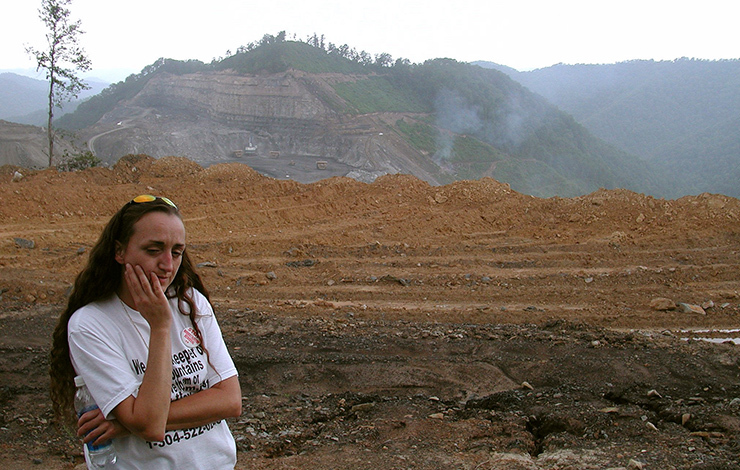 Without the protection of the forest, a devastating flood in 2000 put Gunnoe's home underwater and made her aware of the damage caused by what's become known as mountaintop removal (MTR) coal mining. The flooding was not the only problem caused by MTR. "The water and the air that our children breathe is the worst in the country," says Gunnoe. The blasting emits silica-laden dust from shale and granite, and if inhaled can lead to silicosis--obstructions on the lungs that block the flow of oxygen into the blood. This alone can be debilitating or even fatal but it also weakens the immune system and increases the likelihood of contracting other lung diseases such as tuberculosis or pneumonia. Studies have linked exposure to silica with various cancers (lung, stomach, lymphatic and skin) and kidney diseases such as nephritis and end-stage renal disease. "We've had medical studies done," Gunnoe asserts. "We're finding silica dust in our homes, even in our refrigerators. We as community members are breathing more dust than the workers. They have respirators; we're sitting ducks." Instead of accepting defeat, Gunnoe transformed from waitress to activist, and now works full time to stop mountaintop removal. "I became an activist to fight for what's important to me," she maintains. Recognizing the importance of jobs to the community, she joined other activists to search for alternatives to blowing up the mountains. "We're at a crossroads now and we cannot sacrifice our planet for fossil fuels," she says. "They're poisoning our planet." A study was commissioned that showed that the prevailing winds blowing across the tops of the ridges would provide more energy than the coal being blasted out of the ground. Building and maintaining wind energy devices would also provide more jobs than coal mining, and would not harm people or the environment. Unfortunately, once you destroy the mountaintops, what's left won't be high enough to be used as wind platforms. There's no second chance. Gunnoe's fight to stop MTR and transform the Appalachian Mountains into a wind-energy powerhouse attracted filmmaker Bill Haney and his partners, who feature her in their feature-length documentary film The Last Mountain, which premiered at the 2011 Sundance Film Festival. "I found this amazing community who were pushing to do something extraordinary," says Haney. "They're reminiscent of the farmers who fought the Redcoats during the Revolutionary War--no chance of winning but they forge ahead and win. They're the wellspring of our democracy; democracy is a participatory sport." The film makes it clear who the opposition is and how tough it's going to be to defeat them. We meet Don Blankenship, who until recently was the CEO of Massey Energy. He became known nationally in 2010 when the Massey-owned Upper Big Branch Mine exploded, killing 29 workers--the deadliest mine disaster in 40 years. This mine had over 3,000 safety violations before the explosion, but Blankenship was the master at delaying compliance. He was rewarded with a $6.8 million raise after the accident, pushing his salary to $17.8 million, not counting a deferred compensation package of $27.2 million that year. The film outlines how Blankenship earned his keep by "closing mines and re-opening them with non-union labor." The result: the majority of the miners in West Virginia who were once represented by the United Mine Workers are not today. According to author Michael Shnayerson, "Virtually none are." This has driven down wages, kept miners working longer hours and eliminated jobs. "It's like a jungle, where a jungle is the survival of the fittest," says Blankenship in the film. According to Robert F. Kennedy Jr., who's also featured in the film, there are a lot fewer miners today in Blankenship's "jungle." Kennedy remembers first traveling to West Virginia with his father and meeting coal miners: "There were 156,000 miners there when I was growing up; now there are fewer than 18,000." It's the industry's strategy to "fire the workers and use machines instead." Of the 18,000, "There are only 6,000 in mountaintop removal." Using an old union-busting tactic, the company brings in many of these workers from outside the state, lured by ads in USA Today and other papers. These are not permanent jobs or careers. A typical mountaintop removal mine is blown up, mined and covered up in nine years; the workers are as disposable as the mountain. The company plays on the miners' outsider status, pitting them against local activists who are concerned with their community's health and future. The film takes us to a Labor Day rally Blankenship organizes for his workers and their families, and we see how he uses the stage like a magician who deceives his audience by shifting their attention to something else. In magic, it's called misdirection. "Environmental extremists are all endangering American labor," says Blankenship to the crowd. "In fact, they are making American labor the real endangered species." The crowd eats it up. But the film shows us the reality as it takes us to towns that have been abandoned as a result of the company's policies to eliminate jobs. "We're living in a dead zone," says Gunnoe. The misdirection continues as Kennedy joins other activists at a rally outside the State Capitol to protest MTR. They're confronted by a counter-demonstration of angry miners who deny there are any negative health impacts from their work or the use of coal. They blame chemical plants for mercury emissions and defend coal, since the "Indians" used it too. What appears to be a genuine outpouring of worker sentiment is questionable because, according to Kennedy, they were given the day off by Massey and told to stand in an area "organized as a barricade" between the protestors and the capitol building. One of the film's best scenes takes place in a local café as Kennedy and Bill Raney, the president of the West Virginia Coal Association, an industry trade group, exchange views. Kennedy delivers a blistering denunciation of Massey for racking up 60,000 violations, many of which result in polluting waterways with toxins such as mercury. He says it's worse than "robbing a bank because a kid could eat a fish and get sick and get cancer." Raney retorts, "You guys from up North talk fast." His only defense is to point to the number of jobs coal brings to the state--to which Kennedy responds, "If this is so good for the economy of West Virginia, why is this one of the poorest states in the nation?" While Raney and Blankenship rail about the outside agitators coming in to stir things up, they don't mention that the Frasure Creek Mine above Gunnoe's house is owned by Essar Energy, a company headquartered in Mumbai, India. "This is beginning to look like a banana republic," Kennedy observes. "This is the model for a colonial economy." The film doesn't tackle the growing number of foreign companies engaged in mineral extraction in the US and the huge coal mining operations across the country that are feeding the growing energy demands of the developing world. But it does provide an in-depth analysis of the impact coal has on climate change, public health and the true costs of subsidies and tax breaks. It also lays out a prescription for a non-fossil-fuel future, making the case that developing wind power alone would provide more good paying jobs than coal does and these jobs won't contribute to the destruction of the planet. Instead they'll build a sustainable economy. "Coal is a transition fuel," says Gunnoe. "We can't sacrifice our air, water and health. We've got to look to the future." The Last Mountain opens June 3 in New York City and Washington, DC, through Dada Films, with a theatrical rollout across the country to follow. Michael Rose is a writer, producer and director.